James Harden, Mike Trout and Rob Gronkowski headline Body Armor sports drink’s stable of athlete endorsers and they are front and center, along with Skylar Diggins, Andrew Luck, Richard Sherman and Buster Posey in Body Armor’s new This is Now ad campaign. 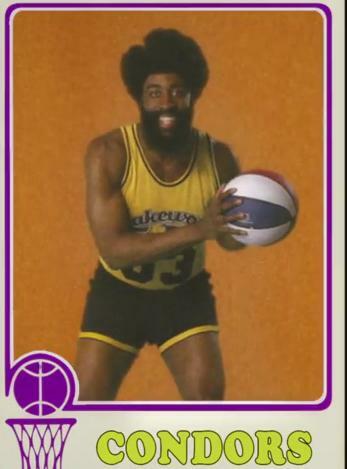 Harden as an old-school, short-shorts wearing hooper? It’s in there. 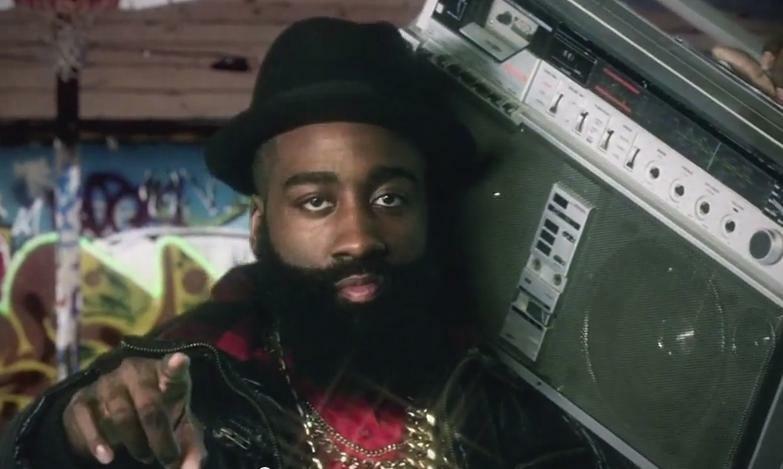 Harden as gold-chain wearing, boom box-blasting dude? It’s in there. Houston Rockets guard James Harden turned in the finest postseason performance of his still young NBA career in propelling his team to a 128-115 game 4 victory. He did so with his team facing elimination for the fourth time this postseason. His playoff career high 45-point effort in game four of the western conference finals ensured the Rockets would extend the series and their season for another game and kept alive their hopes of being the first team in NBA history to win a series after falling in a 3-0 hole. But let’s keep that off in the distance a bit, since that’s really where it is, way off in the distance, three wins away. Houston just grabbed their first win in eight games against the Warriors over the course of this season. Now back to Harden, who has been an offensive force this entire season and on into the playoffs. The best news for Rockets fans, though, is that he has turned it up a notch in the western conference finals against an elite team and an elite defense. It’s also not the first time Harden had raised his offensive game in the conference finals. It’s his third trip to conference finals, first with Houston – and as the chart below depicts (click for larger view), this is his finest playoff performance to date.Remember the totals for his four game ride against Golden State includes his game 3 clunker, 3-of-16, 17 point performance. 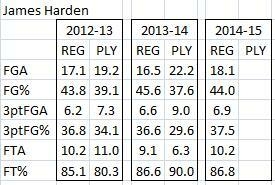 Here are Harden’s offensive numbers in each of his 13 career postseason series. The Warriors have thrown Klay Thompson, Harrison Barnes, Andre Iguodala and others at Harden, and he’s continued his effective, efficient performance. 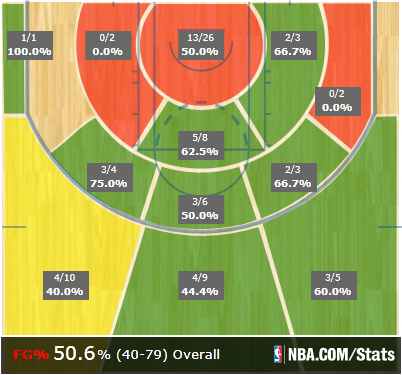 Here’s his shot chart through four games. In his 45-point game 4 performance, Harden was getting it done against all comers. According to SportVu player tracking data, Harden scored 20 points on 10 isolation plays and another 15 points on 16 ball screens. Houston won their pair of titles in 1994 and 1995 and then advanced in the playoffs each of the following two seasons. Since then they had advanced in the playoffs only one time. Just one playoff series victory since 1997, until this season. Twice they have advanced this postseasons and in doing so the Rockets, like their championship teams are showing incredible ability to stave off elimination. Since Harden arrived in Houston, the Rockets have won seven times when facing elimination, including their current four straight wins in that situation. They are 7-2 overall with Harden in elimination games, although if that record doesn’t rise to 10-2, the Rockets will have lost all but 1 of the series they faced elimination. Then again if they stave off elimination and advance this time – they will have made NBA history. – As you know by now the Rockets became the ninth team in NBA history to fight back from a 3-games-to-1 series deficit to advance when they toppled the Clippers in game seven on Sunday. In the first four games of the series, the Clippers scored 109 or more points in every game and averaged 119.5 points per game. In the final three games of the series, the Clippers averaged 103.3 points per game. – James Harden in final three games of series vs. the Clippers: 26.7 ppg, 6.7 rpg, 7apg, while shooting 35 percent FG & 24 percent FT. Houston won all three games. – Josh Smith in series vs. Clippers as a reserve in games 1-4: 9-33 FG (27%), 1-9 3ptFG (11%), 6.3 ppg. Josh Smith in series vs. Clippers as a starter in games 5-7: 15-26 FG (58%), 7-14 3ptFG (50%), 14.3 ppg. – Dwight Howard continues to be the playoff leader in rebounding at 13.8 rebounds per game. – Through injuries and roster changes, the Rockets personnel likely to be used against Golden State is quite different than the group that faced them in the four regular season meetings, all won by the Warriors. 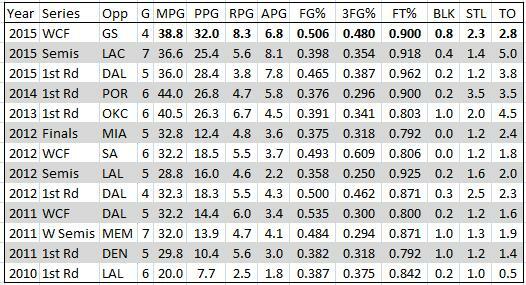 The chart below shows the regular season games, minutes and points in the four regular season games. – The only two Rockets to score 40 total points against the Warriors this season were James Harden (101) and Donatas Motiejunas (52). 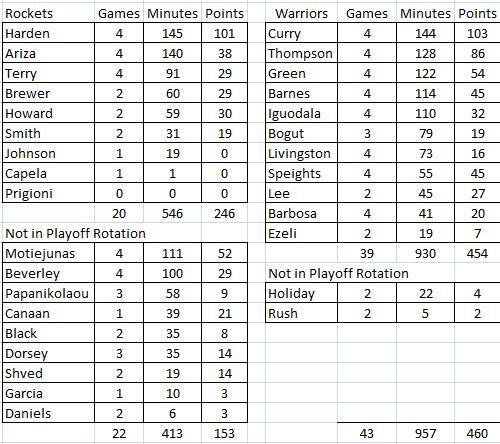 Note Terrence Jones played in zero games against Golden State this season. – Josh Smith posted a career high 12 assists against the Warriors this season. But he did that while still with the Detroit Pistons. He nearly posted a triple-double with 14 points, nine rebounds and 12 assists, though he shot just 6-of-18 and the Pistons lost 104-93. He would play in 11 more games with Detroit, before being waived and signing with the Rockets. He and Corey Brewer played for Houston in just two of the four games against the Warriors in the regular season, with both meetings coming within a month of them joining the team. – There have only been 10 teams in NBA history to win 67 or more games in a season. The last 67-15 team suffered a major upset in playoffs and three of the current Rockets team/staff played in that series. Golden State beat the 67-15 Dallas Mevericks in the 2007 playoffs. Guard Jason Terry was on that Mavericks team, along with assistant coach Greg Buckner, while player development coach Josh Powell was with the Warriors. – The Warriors starting five when healthy is Steph Curry, Klay Thompson, Harrison Barnes, Draymond Green and Andrew Bogut. They went 50-7 during the regular season, which is the second-best winning percentage in NBA history (min. 40 games started), behind only the 1995-95 Bulls that went 72-10 and won the title that season. Current Warriors head coach Steve Kerr was a reserve guard on that team. – That group has started all 10 games in the playoffs and the Warriors are 8-2. So they have nine losses in 67 games as the starting five and Houston is tasked with beating them four times within seven games. – Only once in NBA history before this season had a team made over 867 3-pointers in a season. Both the Rockets, who set the new all-time single-season record with 933 3-pointers and the Warriors with 883 3-pointers eclipsed that total this season. The Rockets handled the Mavericks in the postseason, similarly to how they handled them in he regular season. After beating Dallas three times in four meetings during the regular season, they accomplished the same through the first four games of their first round playoff series. Their game five 103-94 victory, propelled them into the second round for just the second time since 1997. 1. The Rockets needed another fast start, like they’d had in each of the first four games. They got it. Houston carried a nine-point lead into the second quarter, thanks to another hot shooting first quarter. Houston made 13-of-24 shots in the first quarter, including 5-of-10 3-pointers. In the playoffs, Houston is the only team shooting above 50 percent in the first quarter of their games and Houston is way up there at 55.4 percent. Any hopes the Mavericks had of carrying momentum from their game four win into Houston was squashed almost immediately as they managed just 22 points in the first quarter and fell right back into their familiar shooting woes from their first two games in Houston to begin the playoffs. Dallas shot well over fifty-percent in their two games in Dallas, but they shot below 45 percent in all three games in Houston, including just 38 percent in game five. 2. Rick Carlisle certainly thought he found something with the insertion of Al-Farouq Aminu and J.J. Barea into the starting lineup for game four. Their starting five outscored Houston by 21 points in their 18 minutes on the court together and Barea dropped 13 assists, while scoring 17 points. Barea could not duplicate that performance. While he did have nine assists in game five, he was unable to create offense in the half court as he did in previous games. He shot just 3-of-12 and Houston did a much better job of limiting his penetration off of pick and rolls. 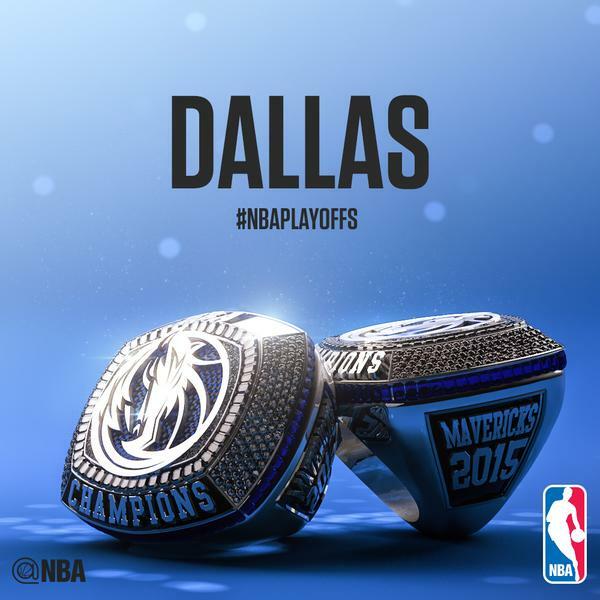 The Mavericks were (+22) with Barea on the court in game four, but a (-19) with him on the floor in game five. Aminu was just as good, if not better, in game five as he was in game four. As noted below, his defense on Harden was strong in the fact that he made Harden work to get what he got. His contributions defensively overall and then additionally on offense were immense. He had 14 points on eight shots, mainly because he made his free throws (7-8). He grabbed nine rebounds and had a game high five steals and also had two ferocious fast break dunks during one of several Dallas’ outbursts in game five. For the series, Aminu shot 55 percent from the floor, 64 percent behind the 3-point line and 79 percent at the free throw line. All were way up from his regular season percentages of 41 percent (FG), 27.4 percent (3ptFG) and 71.2 percent (FT). 3. Kevin McHale said after the series clincher that Houston would not have gotten by Dallas in five games if not for Josh Smith’s play. That’s for sure. Smith was the Rockets second leading scorer in game five, just as he was for the entire series. He dropped 20 points in 22:27 of playing time, made 7-of-12 shots and grabbed eight rebounds in game five. He still made careless plays with the ball, committing four turnovers, but his overall contributions easily outweighed his mistakes in game five and over the course of the series. He electrified the crowd constantly with his creative and constant alley-oop passes to Dwight Howard and saved his best for last with some outstanding play in the fourth quarters of the series. He shot 69 percent in the fourth quarters and led the Rockets with nine 4th quarter assists – nearly all of them the aforementioned rim-rattlers he offered up to Howard. In the five game series, he averaged 17.4 points, 6.4 rebounds while playing less than 26 minutes per game. (His per 36 minute scoring numbers were 24.5 points, again, second best on the team to Harden.) He actually outshot Harden from behind the 3-point line, 39.1 percent to 38.7 percent and made 51.5 percent of his shots from the floor. He was, however, consistently the Rockets worst performer at the free throw line, shooting 50 percent or worse in all five games and just 43.5 percent for the series. After Houston’s game four loss, Trevor Ariza said, “I take a lot of responsibility because I didn’t play particularly well. I played with low energy. That won’t happen again.” He certainly played with better energy in game five, grabbing 11 rebounds for the second time in the series. Interestingly, he’s now had 11 or more rebounds in four of his last nine playoff games after accomplishing that only twice in the first 48 playoff games of his career. He was the Rockets second leading rebounder at 6.6 per game and in this series it was of great importance for him to contribute in that way because he was atrocious shooting the ball. Ariza made only 13 shots in the five game series, while missing 32 times. He was just 5-of-22 on his 3-pointers as well. The Rockets were nearly unbeatable when Ariza hit at least 40 percent of his 3-point attempts during the season, going 24-3, until a pair of losses in the final week of the season to San Antonio, who obviously could be their next opponent. Advancing to the western conference finals likely isn’t happening unless Ariza starts making his 3-pointers. Because he means so much to their defense, he will be on the court regardless, but they’ll need something from him offensively. – Harden had an MVP caliber regular season and could find out this week if he wins the award. And still, his numbers went up in the first round against the Mavericks. He also played fewer minutes per game. While it is completely accurate to say that Al-Farouq Aminu did a good job of defending Harden, it’s also accurate to say Harden still got his. He scored at least 24 points in all five games and took fewer than 20 shots in all but one game. That one game was game three, when he took 24 shots and made 15 of them on his way to a career playoff high 42 points. Clearly in game five, Harden had too many turnovers (6), but even his turnovers were down from the regular season (3.9 per game to 3.8). Also Harden’s usage rate actually went down in the postseason from 31.3 to 29.3. It was a huge bounce back series for Harden, who struggled in both of his previous playoff appearances with Houston, shooting a combined 38.3 percent from the field in his first 12 playoff games with Houston. The contributions from his teammates were also evident compared to last season’s short playoff trip. He averaged two more assists per game compared to last postseason, while playing nearly eight fewer minutes. After playing 40 minutes or more in all six games against Portland last season, Harden played 39 minutes or less in all five games of this series. – To no one’s surprise, Howard clearly and handily won his matchup in last year’s post season against Portland’s Robin Lopez. Well, he did the same thing against Dallas’ Tyson Chandler. Matching up against DeAndre Jordan will be tough, but it will be the first time to see that matchup in awhile since Howard missed all four games against the Clippers. Howard was outstanding against the Spurs this season averaging 21 points, 14.5 rebounds per game and shot 71.7 percent from the field in four games. 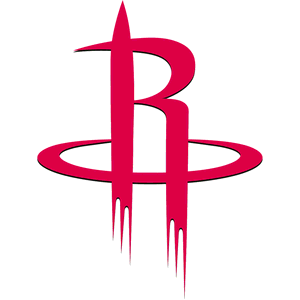 Game one of the Rockets western conference semifinals series will begin on Monday, May 4 at Toyota Center, with Houston holding home court advantage over either the Clippers or the Spurs and hosting games one, two and if necessary games five and seven. 1. The biggest adjustment in the series was finally made and it was actually two adjustments, both made by Mavericks head coach Rick Carlisle. While many are looking at the insertion of J.J. Barea and Al-Farouq Aminu into the starting lineup for game four as a result of injuries to Rajon Rondo, Raymond Felton, Chandler Parsons and Richard Jefferson, only one of those injuries really impacted the decision of Carlisle. Parsons would clearly still be starting and playing the bulk of the minutes at small forward had he been able to avoid surgery on his right knee. But Jefferson and Felton, the game three starters, were both healthy enough to play and it seems safe to say that Rondo is too, he’s just not wanted in Dallas anymore, since the team is clearly more effective when he’s not playing. No, the change was performance based, the two most effective Mavericks in this series have been Barea and Aminu. So starting them and playing both of them more than 35 minutes was the obvious play in game four and it clearly was successful. Dallas shot an astounding 68.4 percent from the floor when Barea and Aminu were on the floor together in game four. The chart below shows the Mavericks two best players in Net Rating (team net points +/- per 100 possessions) over the course of the first four games, along with the Rockets two best players, along with Harden. 2. The Rockets defense was tortured in the two games in Dallas, allowing 249 points in the two games. Dallas shot 53.3 percent overall in their two home games and you’ll see from the chart below, that essentially came from an enormous jump in their shooting percentage inside the 3-point line, especially in game four. 3. As it relates to wins and losses in this series, nothing of great consequence is gleaned from the comparison of fast break points or points in the paint for the teams in the first four games of the series. Through the first three games of the series, Houston was averaging four more second chance points per game than the Mavs (19.3 – 15.3 points per game). 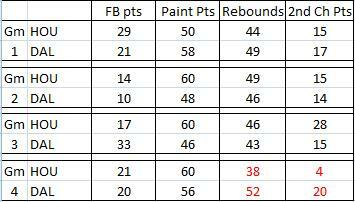 Also, neither team had more than a five rebound advantage in any of the first three games. But in game four, the Rockets were manhandled on the boards and it helped created a monstrous advantage in second chance points. Dallas has grabbed 13 more offensive rebounds in the series and most of the advantage came in game four when they nabbed 16 offensive rebounds and allowed Houston just seven. After the game four loss, Rockets head coach Kevin McHale acknowledged he probably should have played Terrence Jones more, which might have helped the Rockets rebounding. Jones had 13 points and six rebounds in just under 18 minutes. After playing the first 3:35 of the third quarter, he checked out and was never called upon again. The Rockets point guard duo of Jason Terry and Pablo Prigioni are not going to all of a sudden be able to slow down Barea, who has been pushing the pace brilliantly against them in this series. But they can put the ball in the basket, which was a huge reason why the Rockets had three wins, but also their inability to do so contributed mightily to the one loss. Through the first three games, Terry and Prigioni combined to make 9-of-18 3-pointers. In game four, they combined to make just 1-of-8 3-pointers. What’s worse is according the NBA’s SportVU player tracking data, only one of those eight 3-point attempts was contested. Obviously, they were not the only culprits with poor shooting as the team made only 7-of-31 3-pointers in game four and if Dwight Howard didn’t have the worst free-throw shooting performance of his post-season career, that could have helped. Additionally Trevor Ariza is struggling to make any shots in this series, now shooting under 30 percent both overall (11-37, 29.7 percent) and from behind the 3-point line (4-15, 26.7 percent). 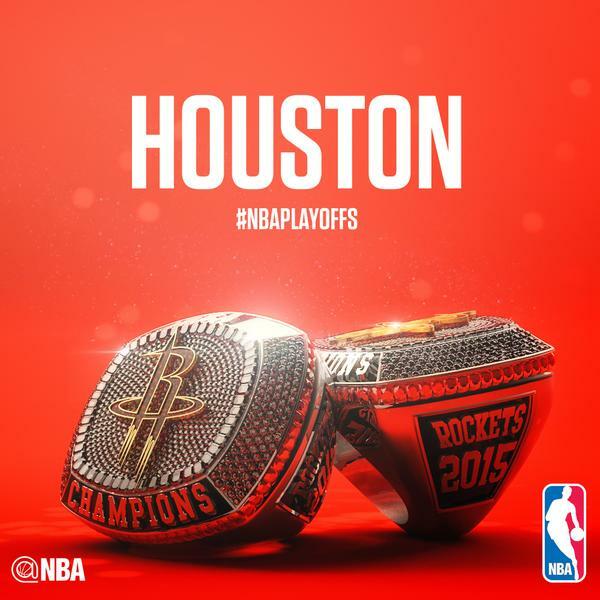 Houston will try again to close out the series and advance to the western conference semifinals for just the second time since 1997 on Tuesday night at Toyota Center. 1. Houston re-shaped their roster pretty significantly around their two stars since they left the floor in Portland following their crushing game six ouster. Three newcomers that played a prominent role in the Rockets game 1 victory each had one very significant thing in common. They’re NBA champions. Jason Terry, Trevor Ariza and Corey Brewer each brought championship experience to a team that had none and it showed in the 10-point victory in Game 1. Three minutes into the game, Ariza had assisted on two of the Rockets first three buckets, had a rebound and a steal on his way to arguably the most complete game of his 53-game postseason career. He finished with 12 points, 11 rebounds, six assists, three steals and just one turnover in just under 38 minutes. It was Ariza’s 767th career game, playoffs and regular season combined, and it was the first time he’d ever amassed at least 12 points, 11 rebounds, six assists and three steals in a game. Jason Terry was instrumental in the Rockets getting off to a fast start, he nearly pulled off his first postseason since 2011, when he made a steal in the game’s opening minutes and rose to the rim – and dropped it in. He made 4-of-7 3-pointers and scored 16 points. He also had two steals to offset his two turnovers. Brewer was his usual self, it just took a while to get there. He scored his first bucket less than a minute after he checked in during the first quarter. Off a steal, he took a pass 80 feet from the basket, turned on the jets and drove past four Mavericks and rose to the rim for the transition basket. But when the fourth quarter started, that was all he had to show on his entire stat sheet. One basket and zeroes across the board everywhere else. Then he exploded in the fourth quarter. While his teammates managed just three makes on 13 shots, he knocked down four of eight, including three 3-pointers. He scored 13 points in the fourth quarter and made sure Dallas never got close enough to make a game of it at the end. 2. The idea that Harden didn’t have a strong game is pretty silly. He scored only 24 points, so the Mavericks executed their game plan of taking Harden out of the game and made other guys beat them, right? He took 11 shots and scored 24 points. He had a playoff career high 11 assists. Those 11 assists led to 27 points. so five of his assists led to five-pointers. That’s half of the 10 3-pointers the Rockets made in the game. It also brings Harden’s total of points he was directly responsible for to 51. He also had only two turnovers. I can’t imagine that’s what Dallas was aiming for. 3. The rotation change behind Dwight Howard is a done deal. Rookie Clint Capela is the backup center and is in the team’s nine-man playoff rotation. He has a lot to learn about defending withou fouling and compensating for the obvious lack of respect he’ll get from officials. But that is no different than the multi-time all-star that he backs up. His impact on the defensive end was noticeable. Howard and Capela played no minutes together and the team played roughly 15 minutes with neither on the floor. Dallas shot 10-31 (32 percent) with Howard in the game. They shot 15-34 (44 percent) from the floor with Capela in the game. With both centers on the bench, Dallas was 19-34 (55 percent). If either or both can stay out of foul trouble, the Rockets interior defense is markedly more stingy. The duo also combined for seven blocked shots. Last season’s Rockets team had some playoff experience led by Dwight Howard and James Harden as both had reached the NBA finals previously in their careers. This season’s team has a lot more postseason experience and it has little to do with the six games added from last year’s postseason trip. So how does it compare to the Mavericks roster, which boasts ten players with at least 10 years of NBA experience? 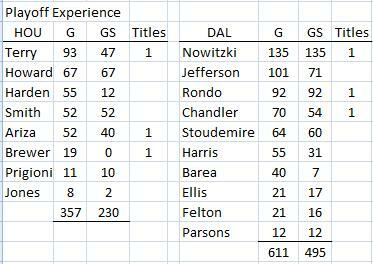 While Dallas has a lot more experience overall, both teams have three titles. Five of which were won in 2011 with the Mavericks. The oddest note about playoff experience? Trevor Ariza is the only player in this series that won a playoff series last year. He did so with the Wizards. – In 73 games last season, James Harden attempted 28 shots or more in a game only one time. That came in March against Portland, he also scored 41 points and made 7-of-12 3’s in that game the Rockets won by five points. In the first round playoff series against Portland, he attempted 28 shots or more twice in six games, including his forgettable 13-35 performance in game 3, a game the Rockets won. He shot under 43 percent in all but one game and 33 percent or worse in half the games. It wasn’t until games five and six, that Harden finally found he and his team’s comfort zone. He attempted 15 shots in each game, matching his lowest total for the series and scored 51 points on those 30 shots (1.7 points per shot) That came after scoring just 110 points on 103 shots 1.07 points per shot). Harden’s shooting success has dipped significantly in the postseason in both of his first two seasons with Houston as you can see in the chart below. What’s worse is that with his shooting percentage on a serious decline, his shot attempts have skyrocketed, especially last season. Last season, after attempting more than 22 field goals in a game just six times the entire regular season, he averaged more than 22 field goal attempts per game against the Blazers in the first round defeat. His 3-point attempts also rose significantly, with very poor results. If not for his 4-of-6 performance behind the 3-point line in game six, the numbers would have been even uglier. Through five games, he made just 12-of-48 3-pointers (25 percent on 9.6 attempts per game). Clearly, the Rockets would like to see a bit better success rate in this series. Numbers closer in step with what he produced against Dallas in their four meetings this regular season. Remember, all but the game on April 2 were played without Dwight Howard, while three of the four were played with both Pat Beverley and Donatas Motiejunas in the starting lineup. Both are now out for the season. Those two are joined by rookie K.J. McDaniels who was apparently hurt in the final game of the season and is now listed out with nondisplaced right elbow fracture. He was not expected to used in the postseason. – The Rockets have seen their fair share of the intentionally fouling, especially during the final week of the season. The shoe might be on the other foot, or rather the brick might be in the other hand in this series. As mentioned here, Rondo had a historically bad season at the free throw line. But no team intentionally fouled him repeatedly to get him to the free throw line all season. He shot more than four free throws in a game just once, going 2-10. But that was with Boston in the first month and none of the free throws were shot after an intentional foul. Poor free-throw shooting and intentionally fouling poor free throw shooters is evidently on the rise, since four others players matched Rondo’s feat (under 40 percent free-throw shooting, with a minimum of 75 attemps) this season alone. DeAndre Jordan did it for the fourth time in his career. Andre Drummond has now done it twice in his three year career, while two other bigs joined the club. One was Ian Mahinmi, who turned in the second-worst season in NBA history at 30.4 percent. The other will be playing in this very same playoff series, or at least sitting on the bench in his Rockets uniform, and he is the record-holder, Joey Dorsey. Dorsey became the first player in league history to attempt at least 75 free throws and make less than 30 percent. He settled in at 28.9 percent, which, despite his sparkling 3-of-4 finish at the free throw line over the final four games was still record-setting.